App targets some of the fast-growing passenger car markets in the region. Singapore, (3 December, 2014) –- MSIG Holdings (Asia) Pte. 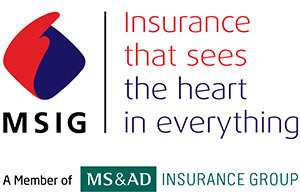 Ltd. (“MSIG Holdings (Asia)”), a member of the MS&AD Insurance Group, the leading general insurer in Asia, today released an innovative new smartphone application. Called “My Safe DriveTM”, the App aims to promote safer and smarter driving across ASEAN and Hong Kong and will be released progressively throughout the region. The launch has been fueled by rising affluence among consumers and an expected increase in passenger car purchases, raising the need for better road safety. The My Safe DriveTM smartphone App improves driving in real time through the power of augmented reality utilising the smartphone’s built-in camera, global positioning system (GPS) and smart software. The App is based on collaboration between MSIG and iOnRoad Ltd., the developers behind the award-winning iOnRoadTM augmented reality driving App. MSIG My Safe DriveTM is available in multiple languages making it user-friendly and convenient for local drivers. Mr. Mike Gourlay, Executive Vice President (Business Development) of MSIG Holdings (Asia) said, “Drivers today are easily distracted with the increased amount of traffic on roads. Instead of having to deal with multiple devices, the MSIG My Safe DriveTM App combines all the latest driving assistance tools such as advanced collision warning, lane departure alerts and more in one convenient smartphone application. Drivers simply mount their smartphone loaded with the My Safe DriveTM App on a standard windscreen mount/cradle, and it detects a vehicle in front of the car through the smartphone’s built-in camera, GPS and smart software. The App provides a variety of features and benefits that can detect the traffic ahead. It also monitors headway distance to the vehicle in front and produces an audio-visual alert to warn of a possible collision by highlighting to the driver to keep a safe distance and avoid tail-gating. In addition, the lane departure alert warns a driver that the vehicle is at risk of leaving the road by indicating that the car has crossed the continuous white line at the edge of the road. The App also produces an audio alert to remind the driver to keep within the set speed limit. My Safe DriveTM App is available for download from 3 December 2014 across the region for all iOS and Android devices. Each download will cost USD 4.99.